In the spirit of National Bourbon month, Distiller has put together a 3-part whiskeygraphic series called "Whiskey Deconstructed,” showing the entire process of making whiskey—what ingredients are used, how they’re combined and altered, and the various steps that lend to the final product and affect each taste profile. Graphic #1 details the mash process beginning with grain selection. This is obviously a step of ultimate importance in the whiskey process as styles such as Bourbon and single malt Scotch are defined at least partially by the mash bill. Don't know what I'm talking about? 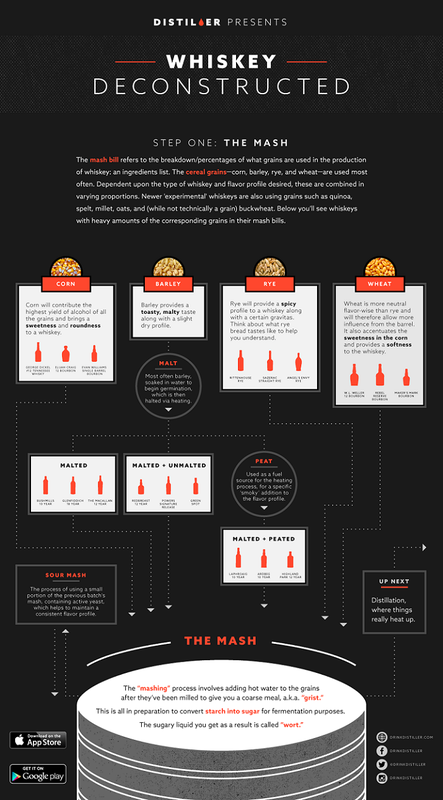 Check out the image below and learn something about whiskey! And of course, if you want to learn even more about whiskey, attend a Women in Whiskey or Flight School event at the Lock & Key Whiskey Bar in Baton Rouge!